This post is frothy. Nothing you don’t already know, but a reminder for safety at charity auctions. You’ll recall that a couple of weeks ago that most of us living in the USA moved our clocks forward one hour to adjust for daylight savings time. And somewhere in modern history, this “fall back / spring forward” shift has also became the de facto time of year when our local firemen remind us to change the batteries in our home’s smoke alarms. Change your clock and change your smoke alarm’s batteries. The fire safety message goes hand-in-hand now. So with fire on my mind, I’ll remind you to keep an eye on open flames at your next gala auction. 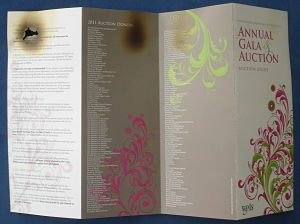 I’ve worked two charity auctions where centerpieces ignited. Gasps and screams erupted quickly and eroded rapidly when an astute observer put several glasses of water to good use and extinguished the open flames. No one was hurt. Last weekend while guests busted moves on the dance floor post-auction, I walked through the ballroom picking up abandoned materials. 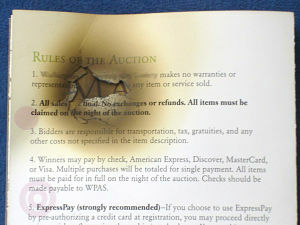 When I grasped this charity auction program, the heat was so intense I dropped it. The paper had been slowly roasting from where it had been carelessly thrown on top of a tea light candle. Had I not picked it up, I wonder if it might have erupted into flames shortly thereafter. People are people and candles will continue to be used at events, but just a reminder that seemingly innocuous situations can become dangerous ones. Keep your eyes open, stay alert, and don’t forget event insurance. Not so light. Thanks for reminding everyone just how dangerous candles can be. Safety at any event is always something to think about, then think about again. I remember when I lit my own hair on fire backing into a candle at a friends party. I didn’t even know it, thankfully someone threw water on me! Hm, were we at the same party? This past holiday, I did the same for someone at a party in D.C. We must hang in similar crowds, Gayle. Glad you weren’t injured. I few years ago at a Christmas Eve service someone lit their hair on fire – not a pleasant smell! (and everyone was fine) Safety is always important – thanks for the gentle reminder. I haven’t witnessed a fire fiasco- but a few water ones. In Austin and New Orleans many charity events had boat components. Thankfully very sober staff too, to catch festive guests on their way overboard. Thanks for the important reminder, Sherry. I’ve been at more than one event where the center piece went up in flames! Not fun for the guests or the hosts! Goodness, I didn’t realize these fire episodes were so common … though it *is* something more memorable for many of us to recall, I suppose! Thanks for sharing.